Happy Monday everyone! I had a nice weekend, how about you? On Saturday, I went stamp shopping with my friend, Cheryl Rowley, and boy is she a bad influence! LOL!! (Only kidding, Cheryl!) Guess what I bought? A Grand Calibur! Cheryl told me she bought one and I had been debating whether I had to have one or not. Then guess what I saw at my feet on the floor of the stamp store? It was fate! So now I own one, but I have to find a permanent place for it. I see reorganization in my life soon! LOL!! I had a great morning/afternoon with Cheryl talking about teaching and stamping! We never have trouble finding something to talk about! While we were at our LSS, Buffalo Stamps & Stuff, our very talented friend Debbie was teaching a class. She does the most amazing 3-D creations with all sorts of images. 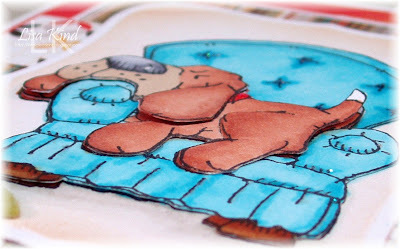 She showed us one she did with a Whipper Snapper dog image called Relax to the Max (thanks to Anna Wight for the link because I couldn't find it!). Well, I had to buy the stamp and try it out. Here's what I did. 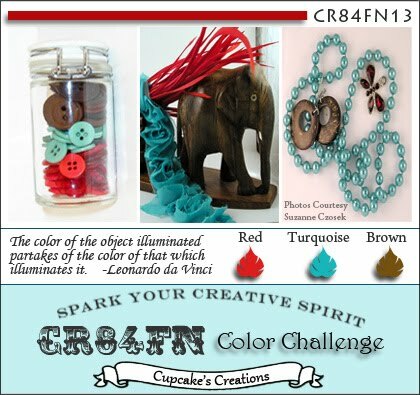 I started with the CR84FN colors of red, turquoise, and brown. Such yummy colors and right up my alley! I found those colors in Basic Grey's Max and Whiskers paper pad. Perfect for my dog image! I stamped the image three times. I cut one of them out with the nestie, one of the dog and bottom part of the chair, and then just the dog. Each one was colored and two were popped up using a dimensional silicone gel. Here's a side view so you can see the dimension. You can see where I cut part of the ear and hind leg for dimension. I hope Debbie sees this (she's not a blogger, but she really needs to so everyone can see her amazing work!). The flower was made with a die from My Favorite Things and Papertrey Ink's felt. I used the smallest one and it's adorable! I used the Sweet Stop Sketch from this week. It worked perfectly for my image. Thanks for stopping in today! Tomorrow is release day for My Time Made Easy and the MTME team will all be posting projects. I have a fantastic project to share with you, so please stop back! See you then! Hi friends! Do you ever leave love notes for your spouse/partner? Or even your kids? 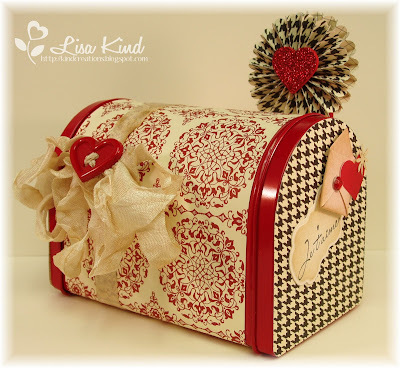 I have the perfect little love notes to share with you and a wonderful little box to store them in. It's getting close to Valentine's Day, so it's perfect timing! 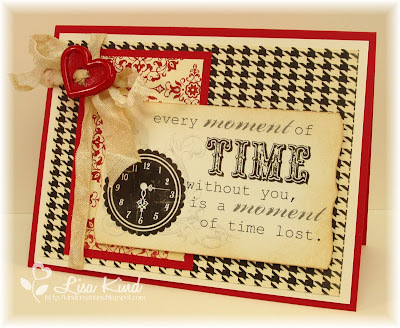 My Time Made Easy is releasing a new template on Tuesday called Creative Card Candy and it comes in a large and mini size. I'm using the mini size today. I love the new digi papers being released this month at MTME! 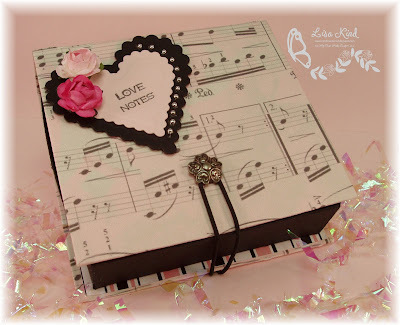 I just love this music sheet paper...perfect for my "Love Notes" theme! 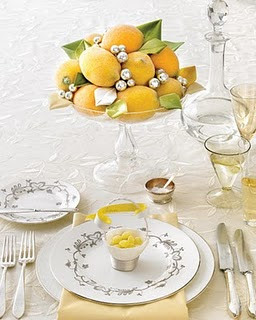 I kept the top simple with a scalloped heart adorned with Martha Stewart roses and some silver pearls. 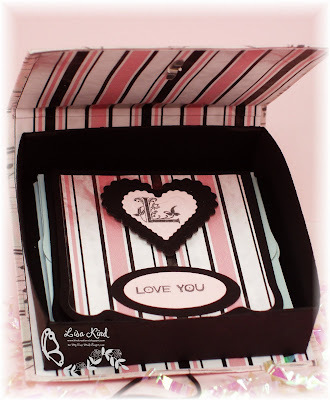 The "Love Notes" title was created using the new Monograms Defined stamp set. It's a great alphabet stamp set and there are adjectives for every letter as well as some other words/phrases. 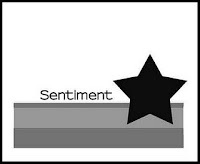 The word "notes" was created using the "Just a Note sentiment". I just masked off the words I didn't want and inked it up. 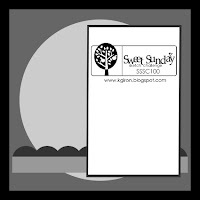 Then I masked all the letters except the "s" and inked it up and stamped it after "note". Easy peasy! I wanted the closure to be something other than ribbon and I found the perfect solution at my LSS yesterday. 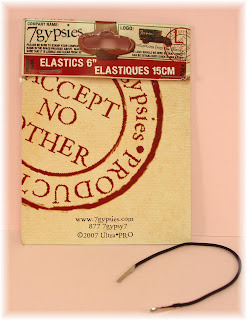 This elastic band has metal ends on it and all I did was make a hole in the inside of the base and string them through the hole (the metal ends are inside the box) making a loop. I put a pretty brad in the center of the top lid, then looped the elastic band around it and it stays closed tightly! 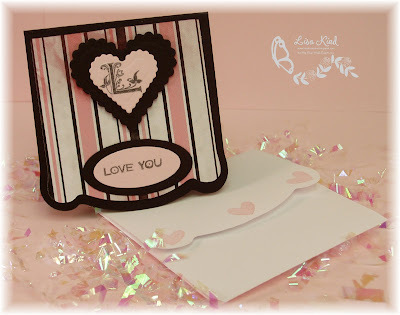 The love notes were cut using the Creative Card 2 cut file. I cut the mat with another new digi paper being released this month. This cut file comes with an envelope template as well. 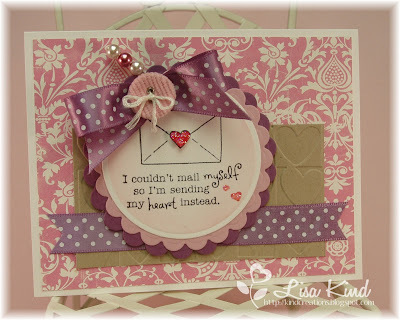 I stamped the hearts (from the You've Got Mail stamp set) on the envelope in Pretty in Pink ink. This template is very roomy. I was able to get three love notes and 3 matching envelopes in there with room to grow! I just love this little set! The paper is just so pretty and the box is really cute! You can see more sneaks from the team. Make sure you stop by their blogs to see what they have created! Thanks for stopping in! 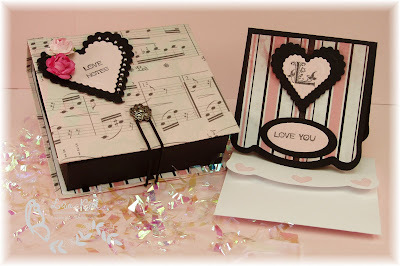 The MTME team will be doing a group post on Tuesday, and I've got another fabulous note set that I made for a friend! See you then! I am so excited about the challenge this week at Just Us Girls! It's Wild Card week, which means the hostess gets to choose any challenge she wants. 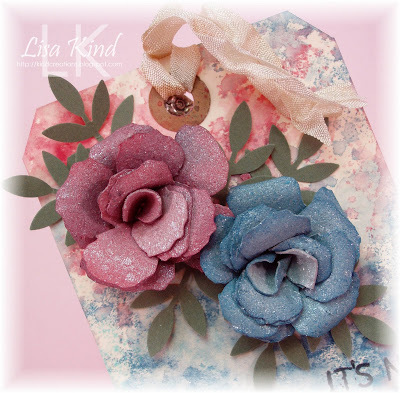 Maria has challenged us to make Tim Holtz-style flowers. I've had Grunge Paper for a long time and have yet to make one of these flowers, so I was really happy she chose this challenge. I followed the tutorial Tim Holtz posted on his blog for these beautiful flowers. Being inspired by his style and the tag he made in this tutorial, I made a tag as well. For the backgound of the tag, I inked up my craft mat with tattered rose, worn lipstick, broken china, and faded jeans distress inks. I spritzed the craft mat with water and placed my tag in there to pick up the ink. Then I dried the ink with my heat gun. I put the tag back into the ink again to ink up some spots that were missed and heated it again to dry. I learned this technique at a Wendy Vecchi class at my LSS over the summer. The butterfly stamp is from a Studio 490 set by Wendy called Botanical Art and the sentiment is from a Tim Holtz set called Just Thoughts. I added some flourished pearls and pearls on the antenna of the butterfly. Now for those pretty flowers. I followed the tutorial Tim posted on his blog using Grunge Paper. I used his Tattered Floral die and cut 6 flowers (you need three for each flower). I inked up three of the flowers in Tattered Rose and Worn Lipstick distress inks and the other three in Broken China and Faded Jeans distress inks. When the flower was all put together, I sprayed it with Shimmerz Spritz in Baby's Breath. I adhered them with large glue dots and added leaves punched with a Martha Stewart punch and Always Artichoke cardstock. I finished it off with some seam binding run through the hole in the tag. The flowers were really easy to create, and I love the outcome! I'll be making more of these for certain! 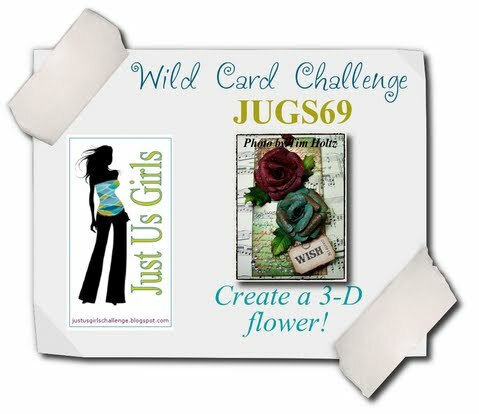 The Just Us Girls DT have some very pretty flowers to spike your inspiration, so please make sure you stop by the JUGs blog. Thanks for stopping in today and have a great weekend! 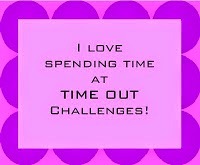 I'm loving participating in challenges this month! 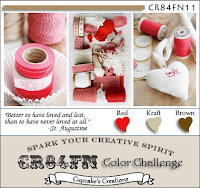 Today I'm playing in the Mojo Monday sketch challenge and the CR84FN color challenge. 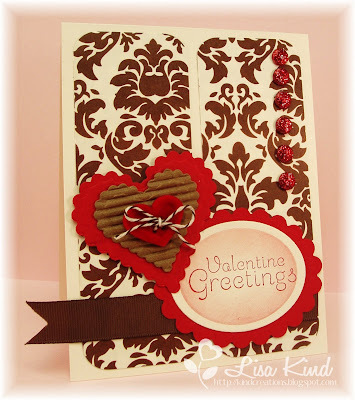 I decided to make another Valentine card using new products from Paper Makeup Stamps. The pretty pink dp and the pin with the pearls are from the new kit called Mon Cheri. The image is from the set Sending You Love. The kraft piece was run through the heart Cuttlebug folder. The plum pudding ribbon and cardstock and lavender moon cardstock are from Papertrey Ink. I popped up the heart on the envelope and added star dust stickles to all the hearts. the bow is tied together with the pink corduroy heart from SU. Thanks so much for stopping in to my blog today! Happy Wednesday! My friend and Paper Makeup Stamps DT member, Dawn, has been using these fun stamps from Kitchen Sink Stamps. They are so cool. Yesterday, she posted that Kitchen Sink Stamps has daily challenges on their forum. Mondays are 10 minute challenges and today the challenge was to use a window pane layout. With their easy use stamps, it should have taken 10 minutes to do this card, but alas it did not! Maybe next time! Here's the 60 minute-ish card! The set I used is called Multi Step Peach. There are four different stamps for the peaches. Each one is stamped in a different color to get that cool shading effect. I stamped the first stamp in barely banana, the second in so saffron, the third in apricot appeal, then lastly groovy guava. The leaves are a three step process. I stamped the first in certainly celery, then garden green, and then eggplant envy. The dp is Basic Grey's Curio and I used a scallop punch for the edge. The button ribbon trim is something I picked up last year at my LSS. The base is early espresso cardstock and I used a PTI impression plate on it. I don't know if you can see it, but it's a diamond pattern. I stamped the sentiment (also from this set) in Memento rich cocoa on the image for two reasons: one because there was no place where it would show up nicely and two because there was a little boo-boo on the peach and the sentiment covered it up! Happy Saturday everyone! 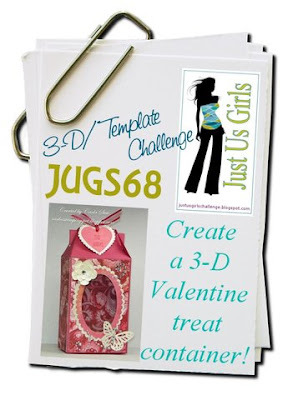 I'm the hostess this week over at Just Us Girls and the challenge is a 3D/template challenge. 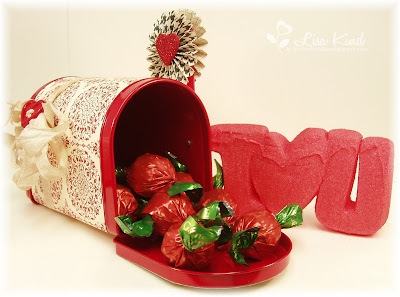 With Valentine's Day looming, I thought it would be fun to make a 3D Valentine treat container. I have had those metal mailboxes (remember buying up all those mailboxes at Target a few years ago?) taking up space in my craft room (I have about 10 of them! ), so I decided to alter one for my project. 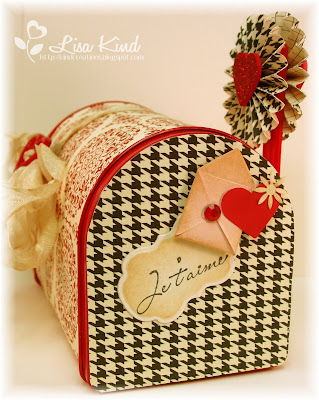 I was in Michael's today and saw a gift card envelope in this black houndstooth pattern paired with red and found that I had dp in that very pattern in the Love Letters dp from SU. I wanted a vintage feel, so I hope I achieved it. I used some seam binding I purchased from Debbie Marcinkiewicz's etsy store. I made one of those shabby bows that I see on Debbie's projects (and hope mine looks somewhat like hers), and added a red heart button. On the flag, I added two Tim Holtz paper rosettes in the black houndstooth pattern and put a red glittered foam heart in the middle of each one. 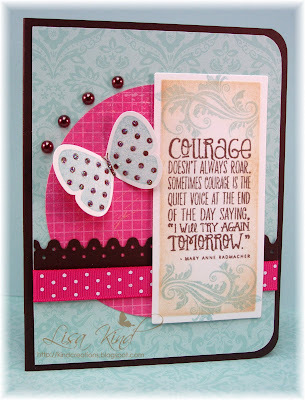 On the front, I added a sentiment included in the Paper Makeup Stamps new kit, Mon Cheri. 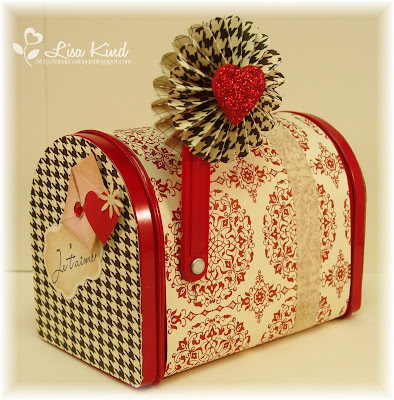 The little envelope embellishment is something I picked up at Target when I purchased those mailboxes so long ago. I distressed both the sentiment and embellishment with antique linen distress ink. 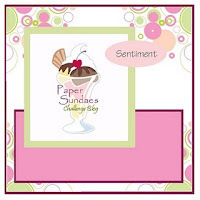 I also wanted to play in the Paper Sundaes 1st birthday celebration because Paper Makeup Stamps is one of the sponsors. The challenge was to choose one of the challenges from their 1st year, so I chose challenge #45 sketch challenge and flipped it. The main panel is from the PMS kit, Mon Cheri. It's chock full of all things French! I used the same dp, ribbon, and button used on the mailbox. Phew! That was a long post to type up! I hope you stuck with me! I'd love to hear what you think about my project, and I hope you can play in our JUGs challenge! Stop by the JUGs blog and see the Valentine containers the girls created! Thanks for stopping in today, and have a great weekend! Yes, I've done a Christmas card! 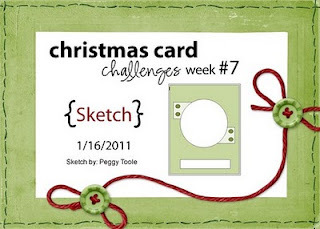 I'm determined this year to make at least one a week, and Sparkle's Christmas Card Challenge blog is a good place to start! 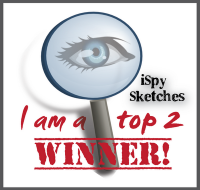 They had a great sketch this week, and you know how much I love sketches! ;-) Also, my friend Shaela is on their team, so I thought I'd play this week. I was looking through my Papertrey Ink Christmas stamps (which really don't get enough use these days) and found Communique Curves which has never seen ink. The dp is from Webster's Pages from the Holiday Collection called Home for the Holidays & Winter Wings and it's so pretty! I cut this one down to fit the card (the papers are in a 6 x 6 pad). The wreath in the stamp set was stamped in Always Artichoke and the berries in Riding Hood Red. I then sparkled them up with some red stickles. The ribbon is Riding Hood Red taffeta. I punched some ferns in Always Artichoke and Riding Hood Red with the Martha Stewart punch. Some sponging, nesties, and dew drops and the card was done! The first one for Christmas 2011! Let's hope this isn't the only one I do until December 2011! LOL!!! Thanks for stopping by my blog! Have a great day! Hi everyone! I was able to do a lot of crafting over the long weekend. I saw a lot of challenges that I wrote down to play in and this was one of them. The Shabby Tea Room has a pretty color inspiration picture that is devine! 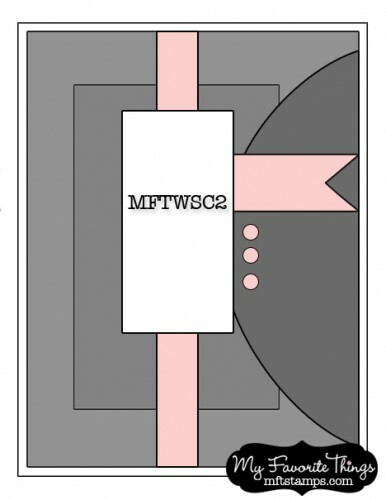 I also saw that the Moxie Fab World blog has a challenge going on called Gray is the New Black. This was the picture I was inspired by as well. Lots of white with bits of yellow and gray. 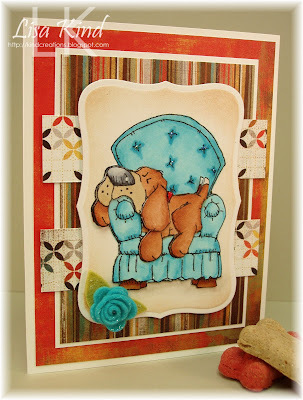 I was also inspired by a challenge from my LSS, Buffalo Stamps & Stuff. Their challenge is to brayer an embossed background. For my layout, I liked the Clean & Simple FTL123. Combining all three challenges, I came up with this card. It's going to be a belated birthday card for my niece. I didn't put a sentiment on the outside like in the sketch. I forgot about that! 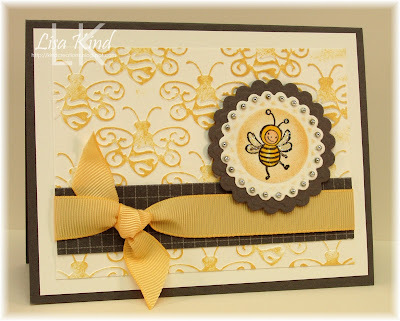 The inspiration card made for the Buffalo Stamps & Stuff used this same bee folder, which I realized I had! The card came together easily using the other challenges. I brayered the embossed layer with Scattered Straw distress ink to match the color inspiration. I then used gray (a neutral that I also pulled from the color inpiration) as my base and dp (from SU). We were supposed to use lots of white on our card for the color inspiration, so I backed the embossed piece with a white layer. The ribbon is So Saffron grosgrain. For the image, I went with this little bee from Just Buzzin' By (SU). I cut and embossed it with a nestie and swept it with some of the Scattered Straw ink. I finished it off with some pretty silver pearls and star dust stickles on the wings. Happy Martin Luther King, Jr. Day! We here in the states are celebrating this national holiday for a great man! This day is supposed to be a day on not a day off, so I hope you are "on" today and doing something worthwhile! I'm hoping to be feeling better today! We'll see how the day goes! 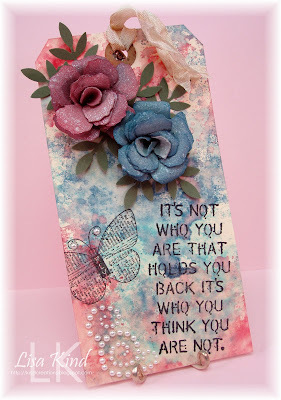 Last night I had some energy to make some cards, and I chose to use the colors from the fabulous challenge blog Color Throwdown. They also have a request to send your card to a young woman in our stamping community named Katie who is going through a rough time right now. You can find the link on the CTD post. I'm sending my card to her to hopefully brighten her day. 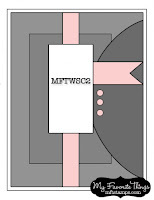 Here are the colors the CTD challenged us to use this week. I also chose to play in the Sweet Sunday Sketch Challenge. I love Karen's sketches and use them regularly. This is the 100th sketch, so it's extra special! This card came together so easily, I couldn't believe it! 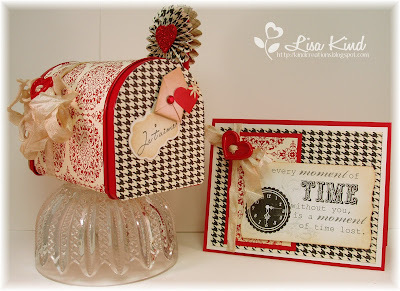 I had all the cardstock, dp, and a great stamp set right at hand! This is what I came up with. This is the first time using the Early Espresso. I had to open the new package (actually I didn't even realize I had this cardstock). The dp is Soft Sky designer prints and Razzleberry Lemonade from SU. 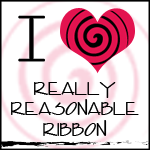 The ribbon is Melon Mambo grosgrain. 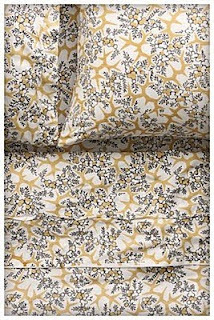 The sentiment and flourish are from Verve's Blue Skies which is stamped in Soft Sky and Memento Rich Cocoa. I thought the sentiment was perfect for what I needed. I added the brown pearls and then thought it was still missing something. I went through my punches and found this butterfly punch from SU (another tool I didn't realize I had!). It coordinates with their set Flight of the Butterfly. I stamped it in the Soft Sky and Rich Cocoa also and added star dust stickles for some sparkle. All in all I'm pleased with this card. Now I just have to finish off the inside and send it off to Katie. I hope you can do the same. Thanks for stopping in today! Love to hear your comments! Hi everyone! I was so excited to have this three-day weekend arrive and guess what? I came down with some sort of bug! I wasn't feeling that great all week, and then yesterday it hit HARD! I was on the couch all day! And today is better but not much! However, I did get down to my craft room to stamp later in the day. Yesterday, while I was on the couch, I did get some productive commenting in and looked at some interesting challenges. 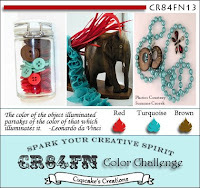 I loved Mona's CR84FN color challenge of red, kraft, and brown...my type of yummy colors! I love sketches and the Card Patterns sketch this week caught my attention. So I combined the two and came up with this pretty Valentine's card. I started with this paper from My Mind's Eye called Lush. I remember seeing my fellow PMS member, Tina Hale, use it and had to order it. That was about 6 months ago! I was waiting for the perfect card to use it on! Now I changed the sketch a little (sorry Card Pattern team), but I wanted a heart on it for a Valentine card. The kraft on this card is from a Starbucks sleeve. I love my Chai tea and went out for a bit today to get some fresh air and my tea, so I decided to incorporate it into this card. The velvet button is threaded with some brown and white baker's twine. 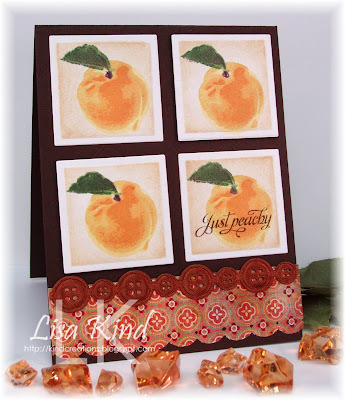 The sentiment is from an SU set called Grateful Greetings stamped in real red. I added the red glitter dots on the opposite side from the sketch because it suited my card better. I left the brown grosgrain ribbon hanging off the edge a bit...I just like that look! Thanks for stopping in today! I hope you are enjoying your weekend! Happy long weekend everyone! I just love them! 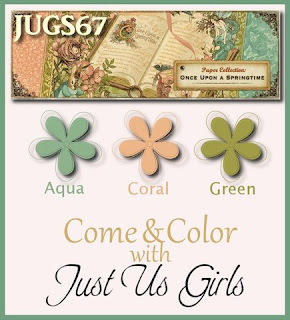 Today the Just Us Girls team has a fab color challenge for you. 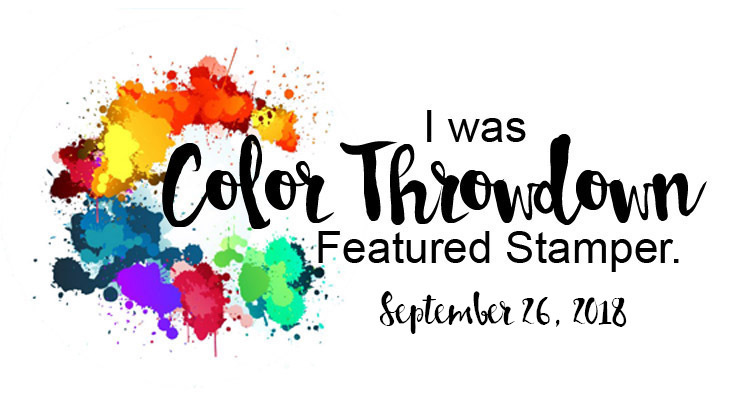 We did something different this week and had our Guest Designer, Carla Suto, choose the colors! And I love the colors she picked! 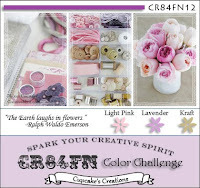 She based her colors on the Graphic 45 collection Once Upon a Springtime. I love Graphic 45 papers and while I didn't have this collection, I did have the Le Romantique collection (which I received in a gift exchange from Bonnie Sharp) that had the same colors. So here's what I did. I chose a sketch from My Favorite Things Wednesday Stamp Club and a stamp set I've had for a while and haven't used from Verve called Blue Skies. I distressed the piece of Aqua Mist with tea dye distress ink to tone it down a bit. The beautiful butterfly is a Spellbinder die that I cut with Vintage Cream cardstock, then sponged with Cameo Coral and Cool Caribbean inks. Then I distressed it a bit more with the tea dye ink and added star dust stickles for that sparkle I love! The half circle was cut with a Coluzzle. Remember that thing? My nesties were too small so I had to pull that out. Fun little tool! 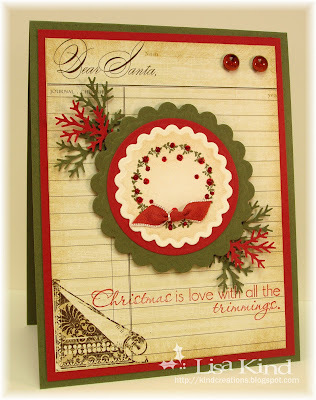 Stop by the JUGs blog to see the beautiful creations form the team and our Guest Designer, Carla Suto! Make sure to leave them some love! Just Us Girls #66 and Gina K Designs!! Happy New Year and a New MTME Release!